For my last brew of 2015, I’m making a session IPA that is a modest departure from my previous session IPA. This is primarily to adjust for and use up ingredients on-hand, but also in order to try out a new yeast strain with some promise for session beers (“Conan”). I used WLP002 (English ale) for my last session IPAs, and liked it, but thought that the potentially low attenuation of Conan also has promise for a session IPA. We’ll see how it works! The other twist on this brew is that I’m using Jarrylo hops, a relatively new variety. They’re not particularly intended for IPAs, but an IPA seems like a good way to showcase hop character, particularly in the late additions and dry-hop. Because Jarrylo is described as having notes of banana, pear, and spice, I figured some more citrusy/fruity varieties would meld well for the bittering and flavor hops additions. So, Citra and Mosaic are also in the mix. When smelling the Jarrylo hops pellets, I get a fair bit of pepper and maybe some fruitiness behind that. Perhaps it’s a mistake to dry hop with this one for an IPA, but that’s what homebrewing is all about! I mashed in with 3.75 gallons of water at 169.8°, to hit a mash temperature of 156°. The mash was down to 153.5° after 25 minutes and 150° after 45 minutes. 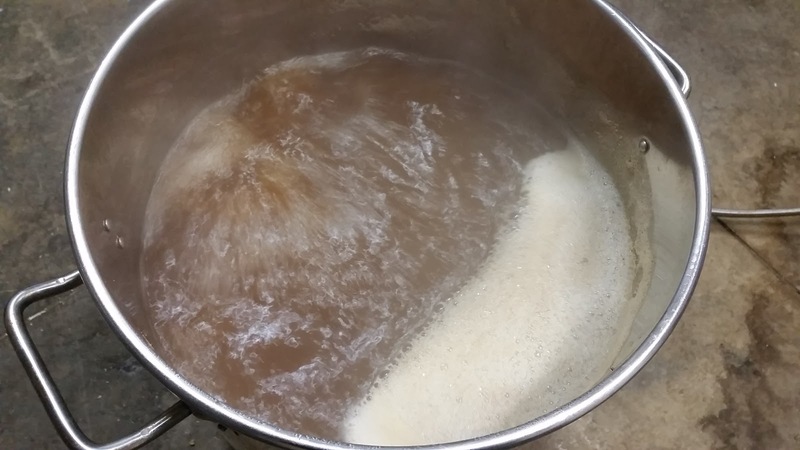 After 50 minutes, I added 1.1 gallons of water at 190°, to raise the mash temperature to 156°. I elected to use a shortened mash procedure in order to add a tiny extra bit of body to the final beer (per the session beer workshop I went to at AHC). So, only 60 minutes passed between when I mashed in and when I collected the first runnings. I vorlaufed and collected the first runnings, and added 3.75 gallons of water at 179°, which raised the mash bed to 166°. I let it sit for 10 minutes, vorlaufed, and collected the remainder of the wort. I collected a total of 6.9 gallons of wort with a gravity of 1.037. This equates to an extract efficiency of ~75%. I started the boil, and added the hops per the schedule above. After 60 minutes of boiling, I turned off the heat and chilled the wort to 70°. Then, I pitched the yeast and set the beer to fermenting, at 68°. I brewed this batch on 30 December 2015. Starting gravity was 1.047. Note on the yeast starter: Because I am liking the Conan strain, I overbuilt my starter. I made 1.6 L of a 1.040 gravity, and set aside 0.6 L for my next batch (~100 billion cells, approximately). This entry was posted in session beer, session IPA and tagged Jarrylo Session IPA, JSIPA. Bookmark the permalink.